Shielder class, Mash Kyrielight, has another figure and this is by the acclaimed company Stronger which is a reputable company that has made many popular figures. In fact, this figure of Mash is a 1/7 scale that stands at 31 centimeters and is able to swap two different arms (with and without full armor) and also between two different waist armor pieces, so you can display them with or without the armor. In the blister you can see the two different sets of arms that Mash comes with. 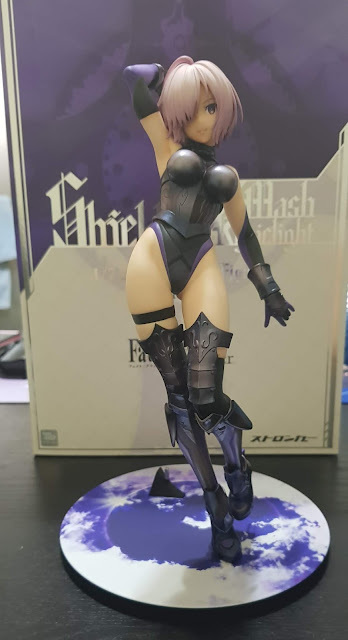 The default waist armor that the figure is donning is the most revealing of the three. 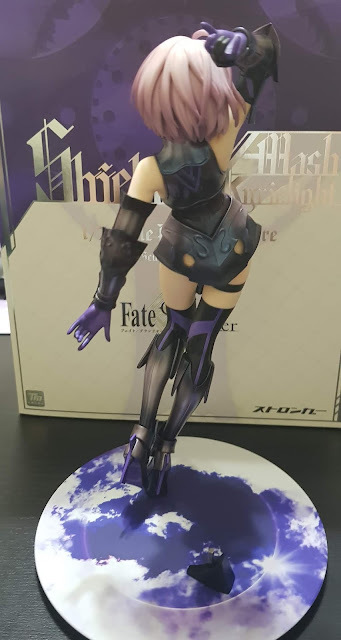 The small metallic colored waist armor piece to her right helps her to look more battle-ready. 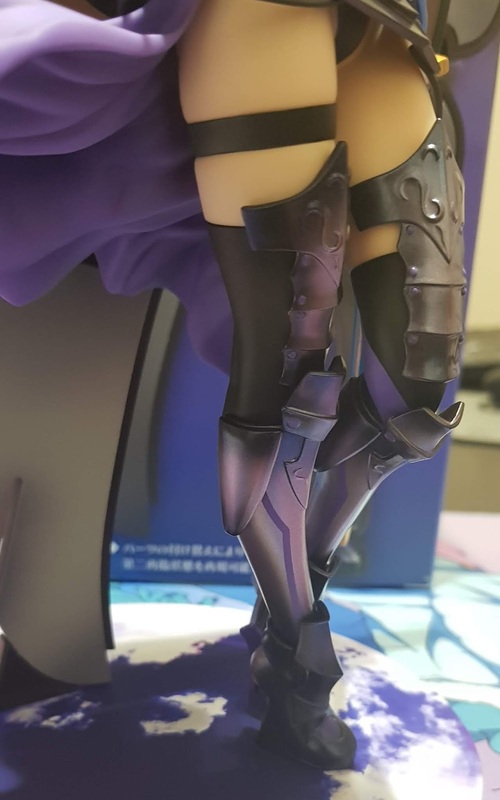 From the back of the blister, you can see the intricate designs on her shield as well as a sword and cape that comes with one of her alternate waist armor. Right out of the blister, let's focus on her base. The base is small and compact, featuring the wallpaper with blue skies and clouds from the FGO mobile game. 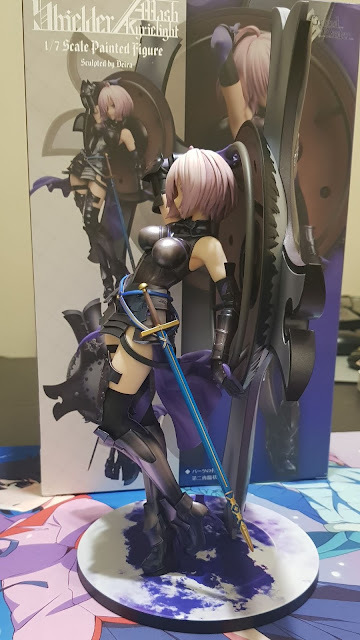 This is simple and effective, adding a different color scheme to Mash but not stealing the limelight from her. 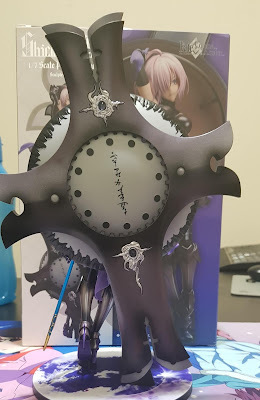 There are two pegs on the base, one for Mash and for the shield that she comes with. 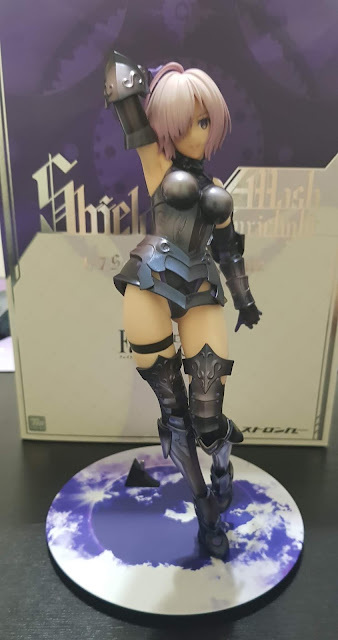 Both Mash and the shield attaches extremely tightly to the base so I'll highly recommend deciding on how you would like to display them before putting them on the base so you'll not risk breaking anything when taking them off the base. 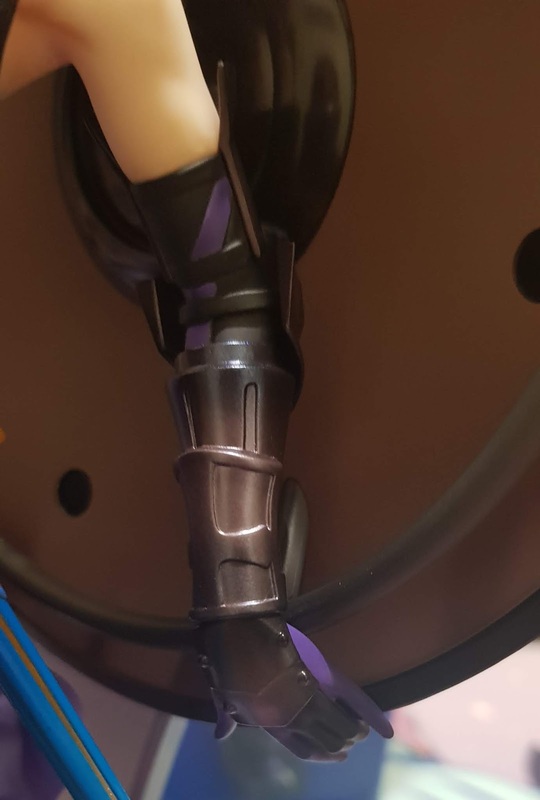 It also seems to be easier to put Mash onto the base before attaching the shield. 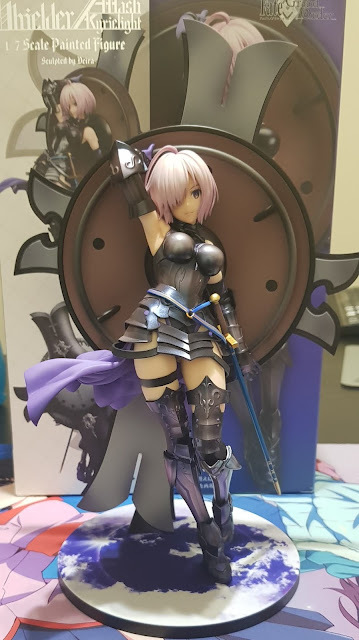 As this is a review for Mash, I'll showcase Mash with all three different designs for her waist armor as well as how both arms looks with the shield. Here's the complete appearance of Mash with the default waist armor look and less armored hands to hold the shield behind her. Something that I don't like about this figure is how you can't see the intricate designs on the outside of the shield as only the inside is facing the front. 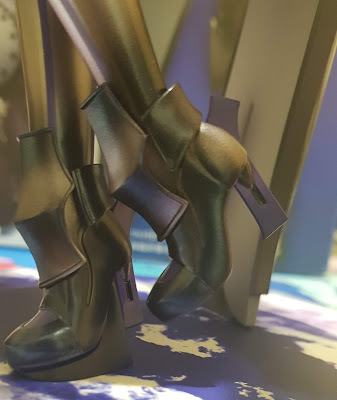 However as such, more effort is also placed into making the inside look more appealing, for instance adding a brown gradient and shading at the edges, as well as the addition of a silver metallic paint flanked by clean dark grey borders at almost all the sides. 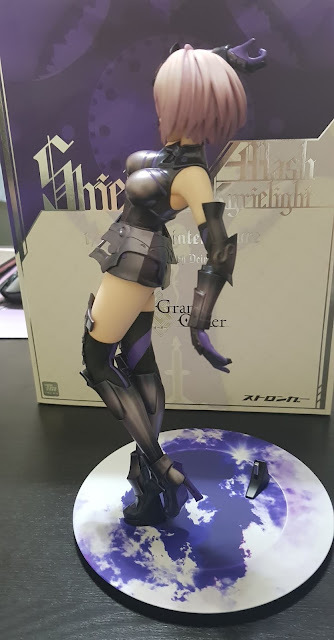 Next up is Mash with her first waist armor and full-armored arms (image below). 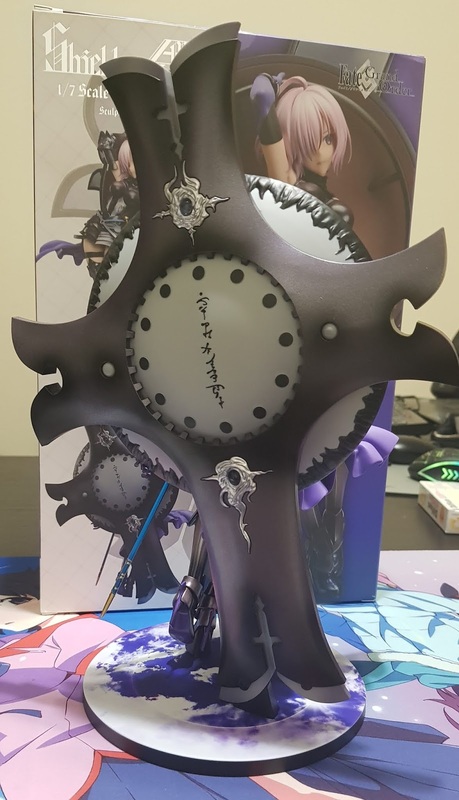 Intricate sculpting that brings all the rivets and engraving to life as well as paintwork to make the ensemble appear as though it's really metal. 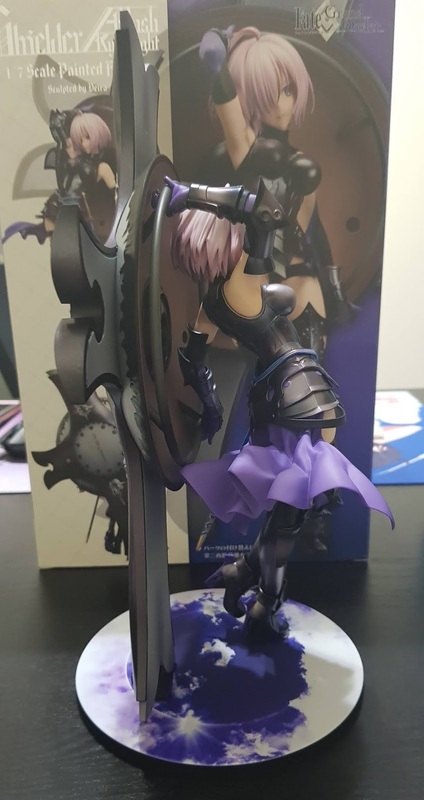 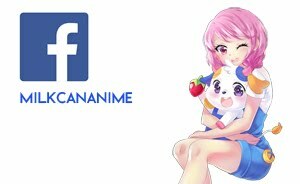 Mash's arm is also sculpted to have slight biceps and shaded to make her look lean and muscular. 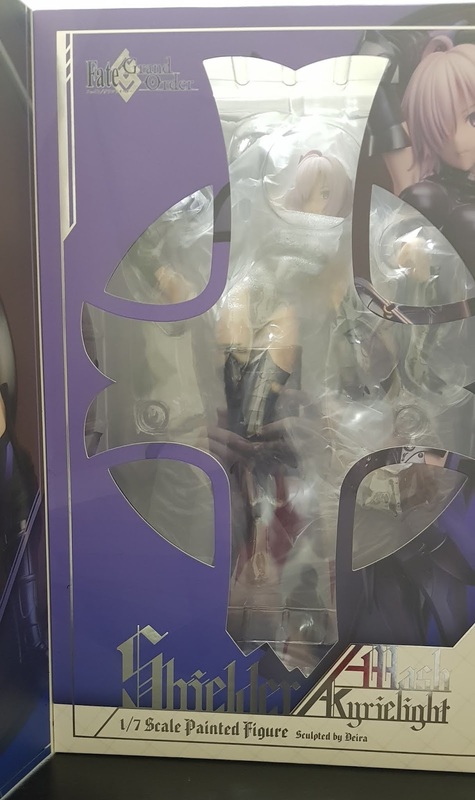 The slight bulge above the armor also realistically conveys the tightness and weight of these armor pieces. 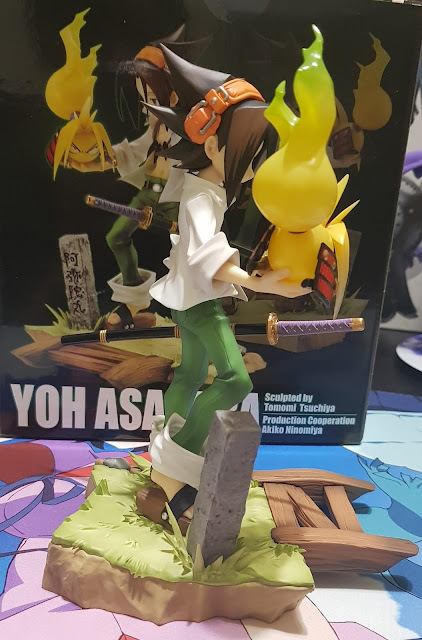 Back to the waist armor. This one has a small gap to add some feminism into her look. 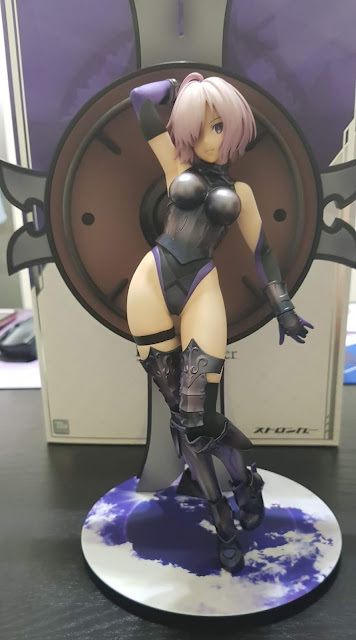 Unfortunately, I am not into FGO and do not understand the nuances between the different armors, but I believe that if you do know them, this figure would be a lot more meaningful for you! 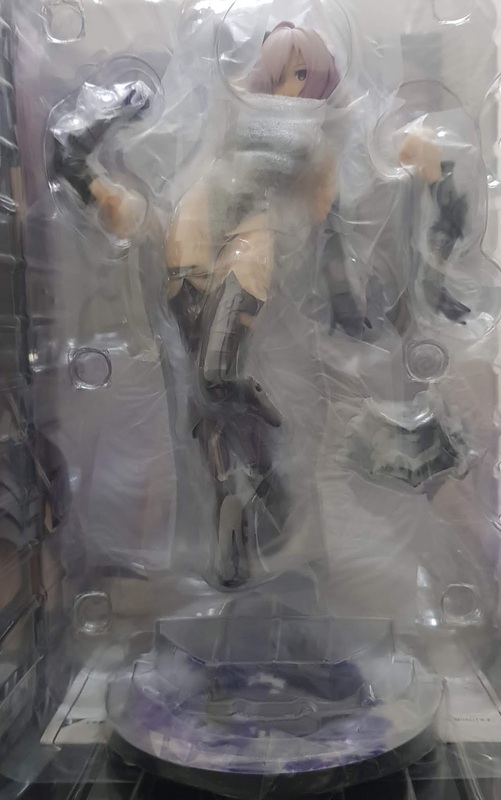 The next waist armor (image below) is slightly different, with three metal plates below the gap instead of just one. 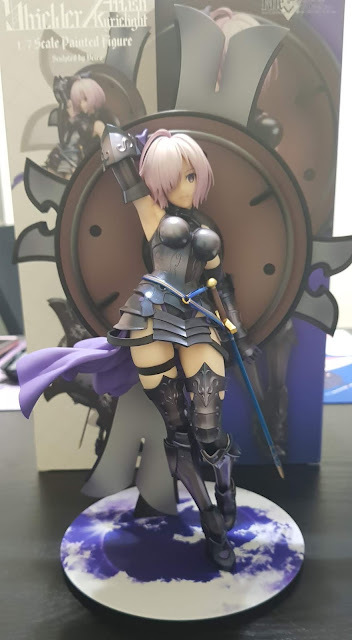 I find this armor the most alluring of all, especially with her sword and cape as it creates a very nice color contrast between the purple-tinted armor and the royal blues adorning her sword. 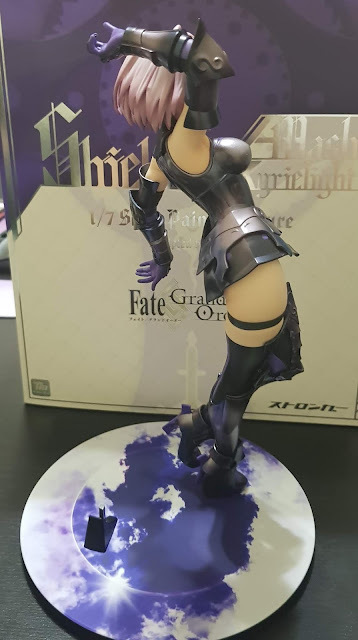 The gold right and stripes stands out well and lightly matches the gold on her sword's hilt. 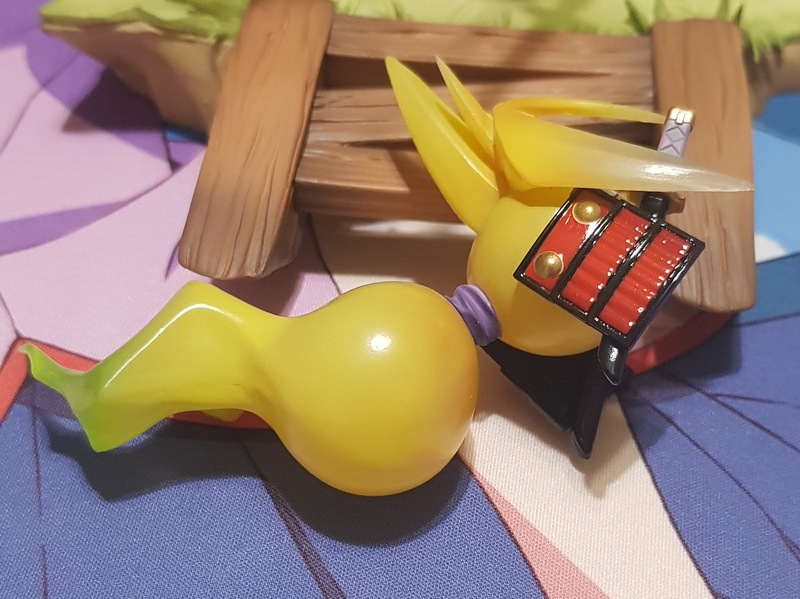 The only shortcoming here is that the blue belts can be sculpted to look like they are looping through the hoop instead of merely looking as if they molded into the hoop itself. 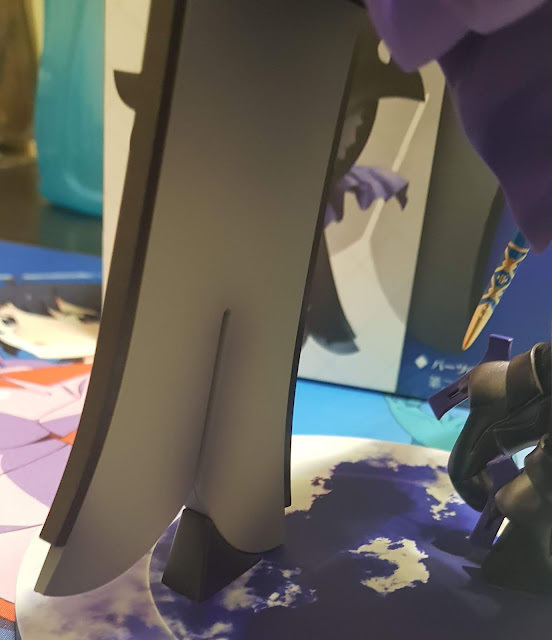 I love how the purple cape part splays out so beautifully, adding a touch of movement and dynamism to the figure! 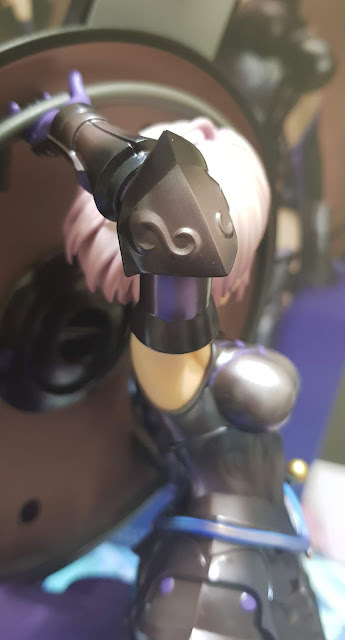 Mash's facial expression is as stoic as she is usually depicted and the paintwork and decals are carefully applied. 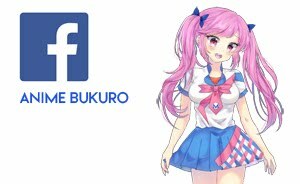 Minimal shading is done to her face and skin to help keep it look soft and youthful. Though the effort saved on this aspect is utilized to improve the sculpt and paint work. Other than the armor parts I've mentioned earlier, I actually think that the sculpting for Mash's hair is beautiful. 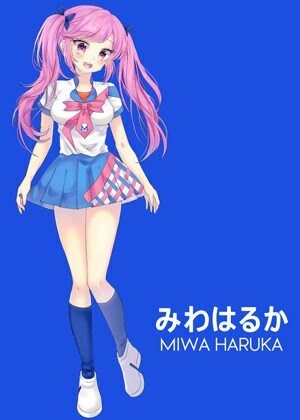 The ends of her hair are also crisp and sharp and some shading is done to add the perception of depth and volume to her hair. 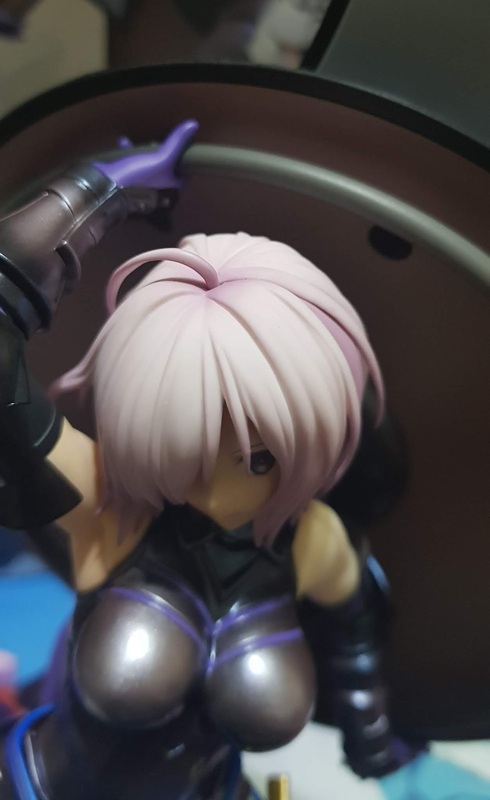 There are also no visible hair seams even at the top of her head, and darker shades of pinks and purple are used to shade in between the layers of her hair. 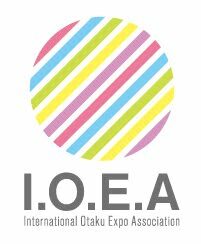 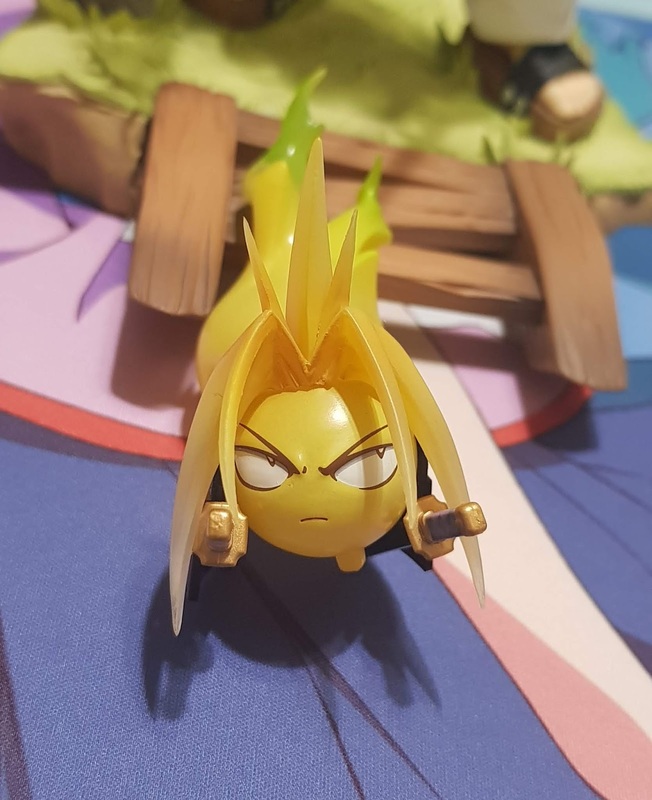 Even the start of the ahoge appears to be rather natural looking! 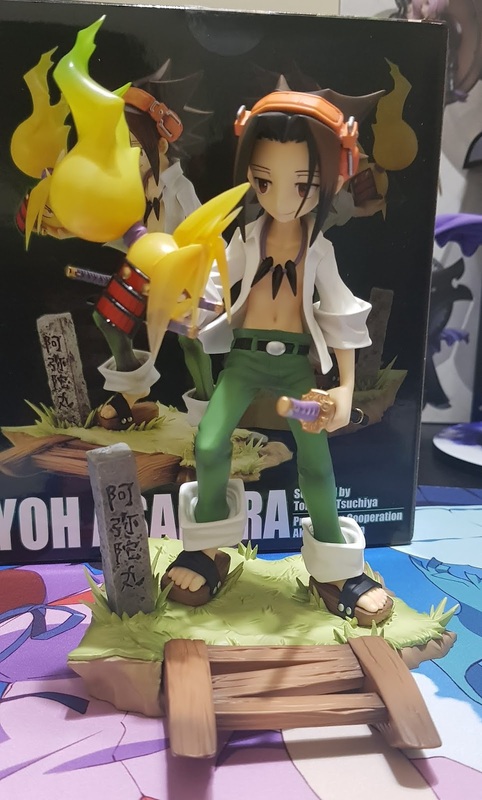 With Shaman King's anniversary, Kotobukiya came up with the figures of the Asakura twins to commemorate the event. 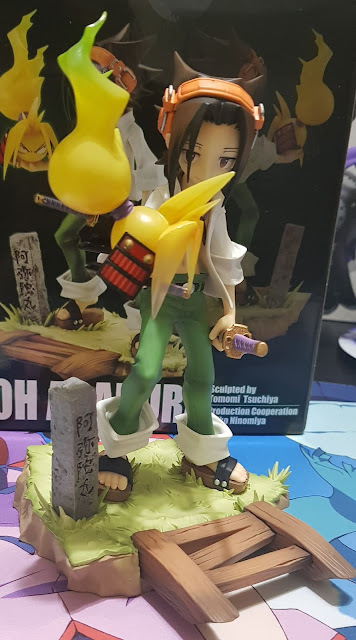 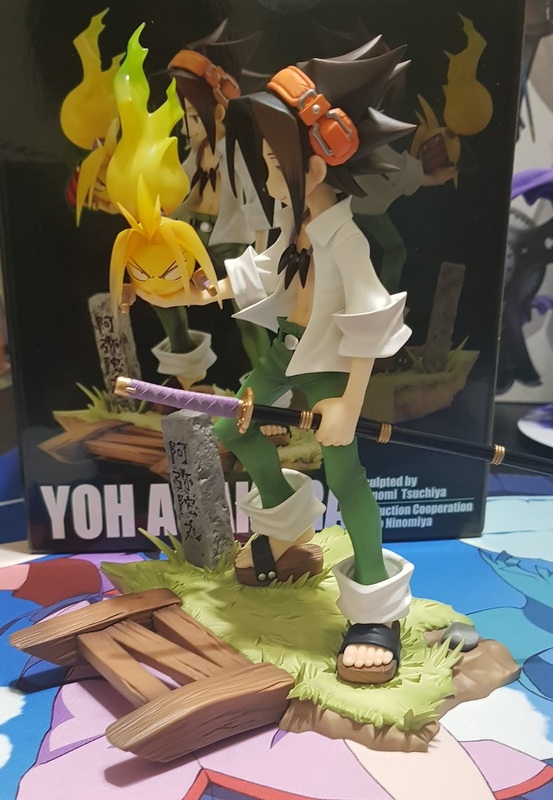 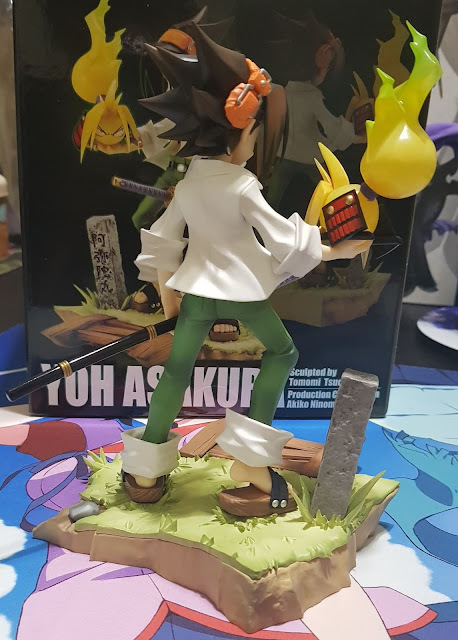 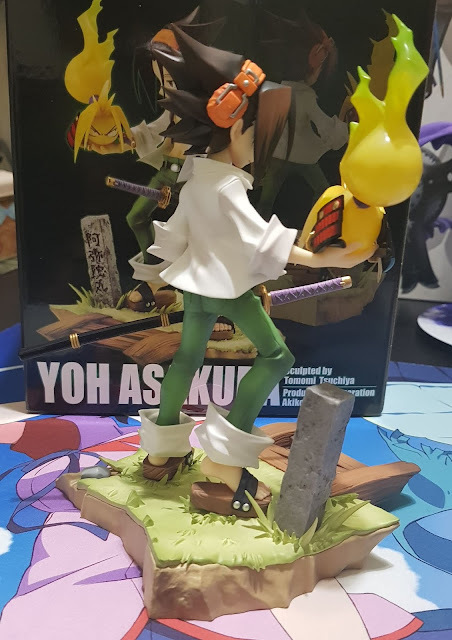 The first figure to come out is the main character of Shaman King, Asakura Yoh. 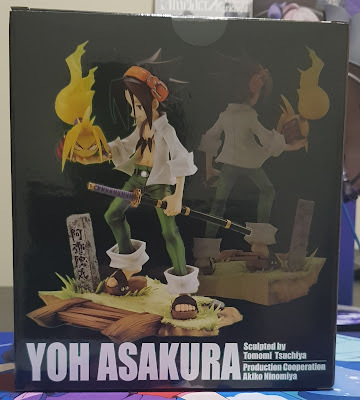 The box is simple, with some retro-feel to it, suitable for this series. The back of the box shows a glimpse of how the figure would look like after it is assembled. Yoh is standing on a grassy lawn with the start of a wooden bridge before him, as he gazes at a stern spirit-ball of Amidamaru that materializes next to his stone grave. 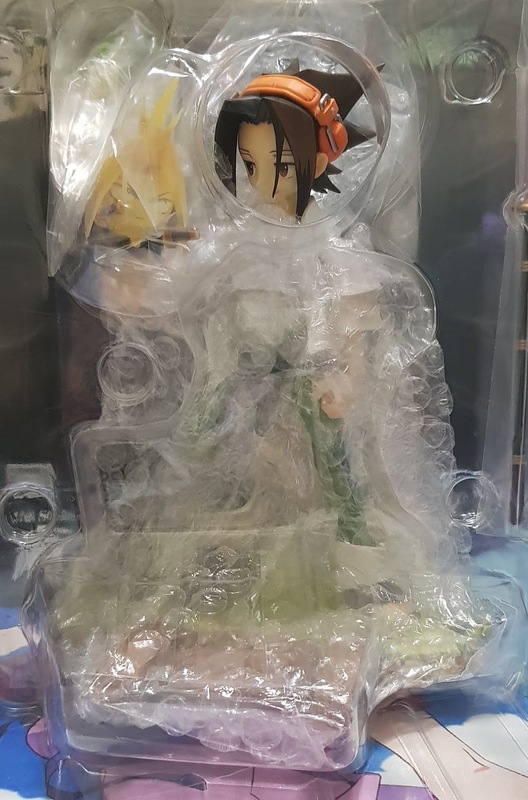 Yoh is packed in a tight and sturdy blister, with an extensive amount of plastic and bubblewrap to prevent any mishaps and paint transfers during mailing. 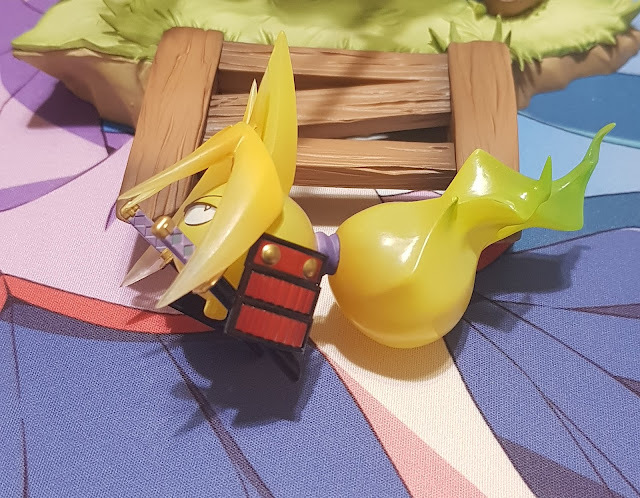 The blister also has a cut out at the front for collectors to view Yoh's facial features clearly without any obstruction. Right out of the blister, you will see that there are three parts to this figure. 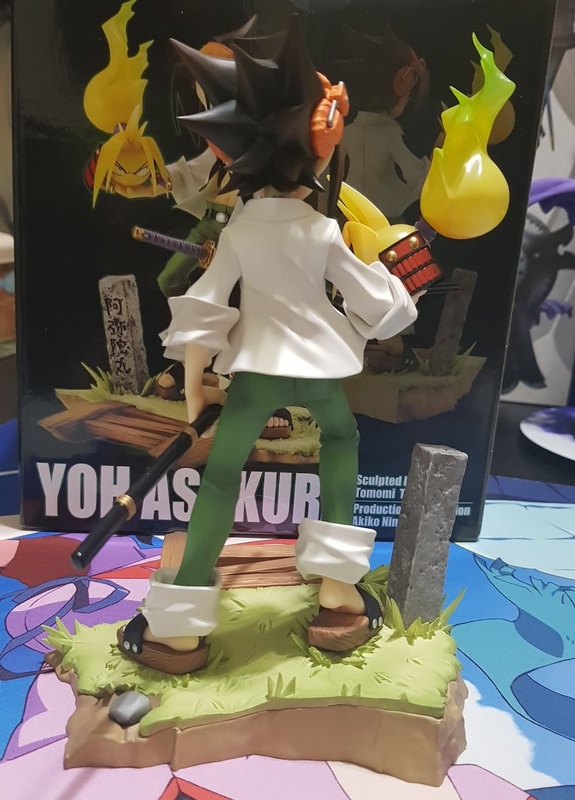 Amidamaru's spirit ball, his sword, and Yoh who is connected directly to the base. 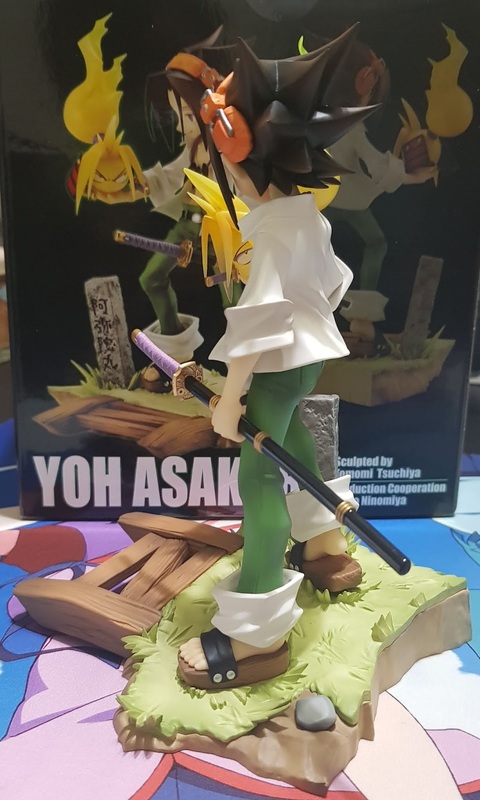 A simple 360 of the figure shows that the sculpting is similar to the series' artwork. 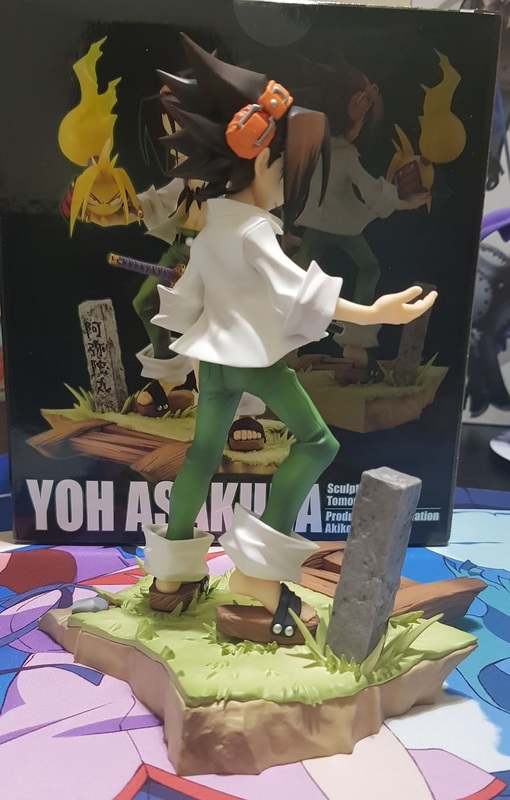 The base is also incredibly detailed as you can see each blade of grass sculpted realistically and optimally positioned. 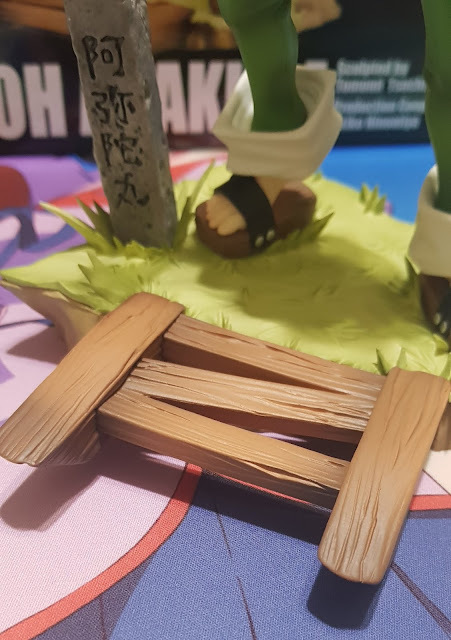 The bridge also has the wood grain pattern sculpted into it, and shaded with a darker brown to add depth. 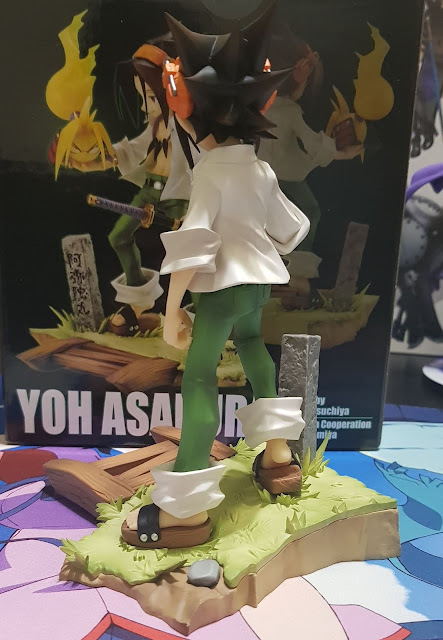 Even Amidamaru's gravestone has detailing to make it look rougher and aged. The engraved kanji for Amidamaru's name is properly etched into the stone. 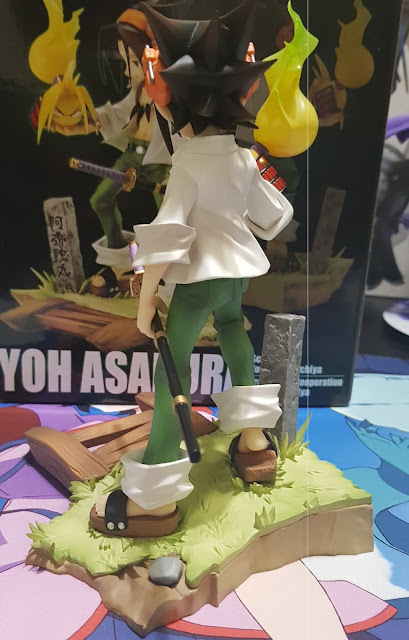 Other than the base, these small details are also visible all over the figure. 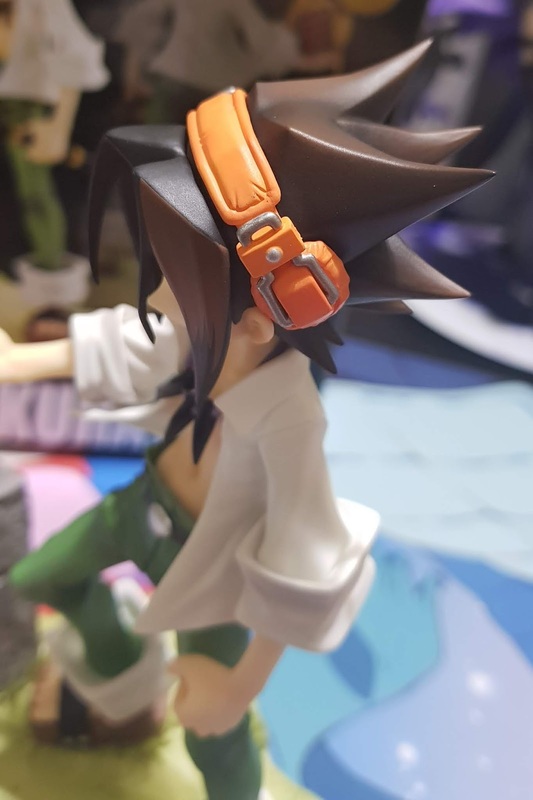 The first thing I'll like to point out is Yoh's orange headphones. 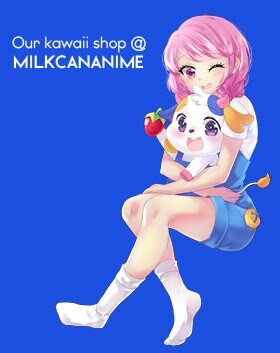 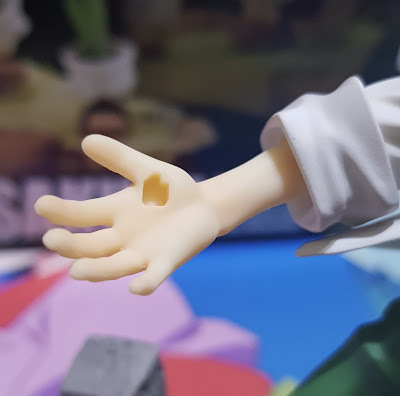 They are sculpted to look soft and comfortable, with the plush parts adequately wrinkled. 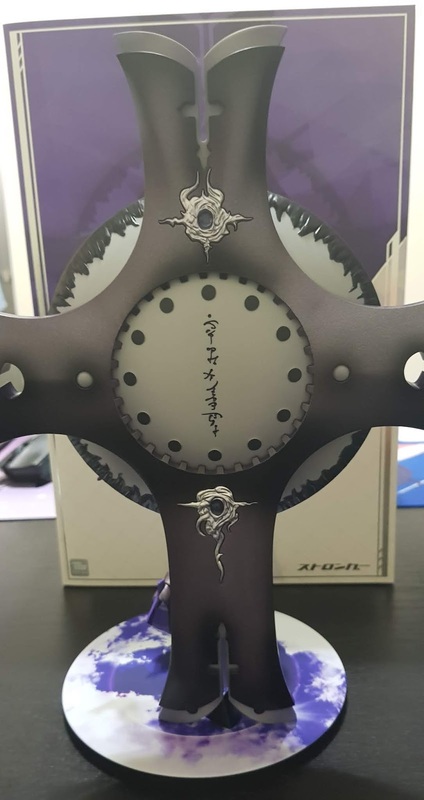 The small metal parts for adjusting the height of the ear parts are painted in a metallic paint, yet there are no paint transfers between this silver and the matte orange. 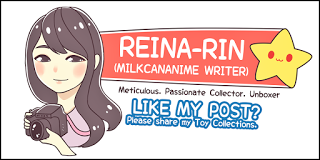 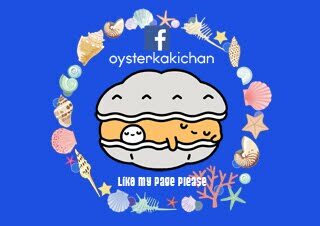 The second point would be the accurate depiction of Yoh's hairstyle and shading. 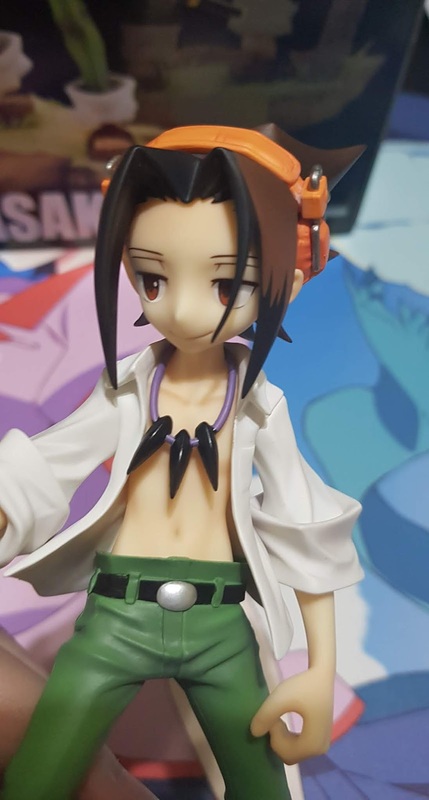 The lighter brown on the upper half of Yoh's bangs is exactly how it is typically colored in the manga and Kotobukiya has replicated this similarly in their figure. 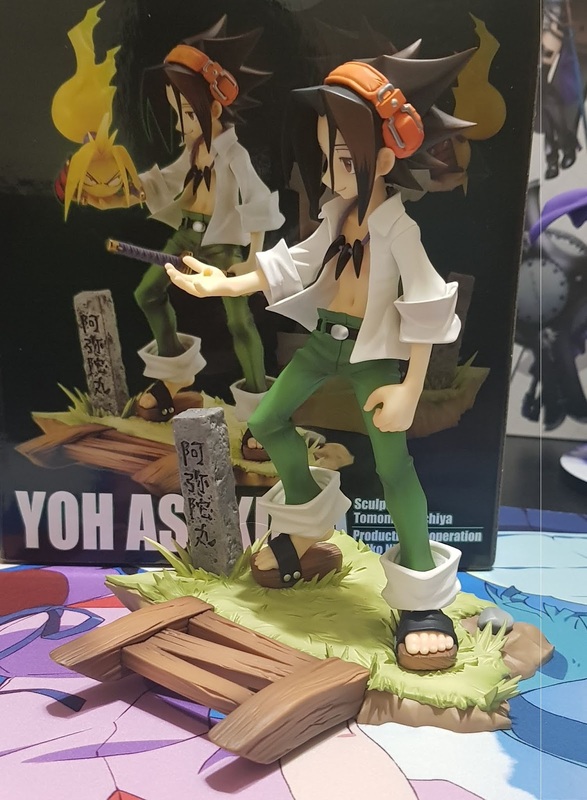 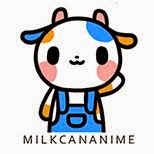 Other than this, the strange method clothes are depicted in the series as well as the slim limbs and large appendages and accessories are also fairly accurate! 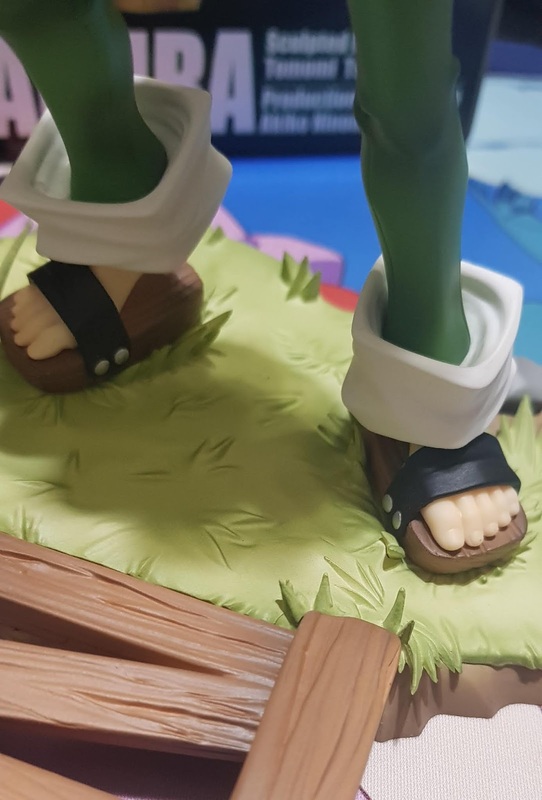 The sculpt and paint work on Yoh's sandals are similar to that at the bridge, and the lifted right foot also allows you to appreciate the effort placed into the sculpting and painting of the sandal better. 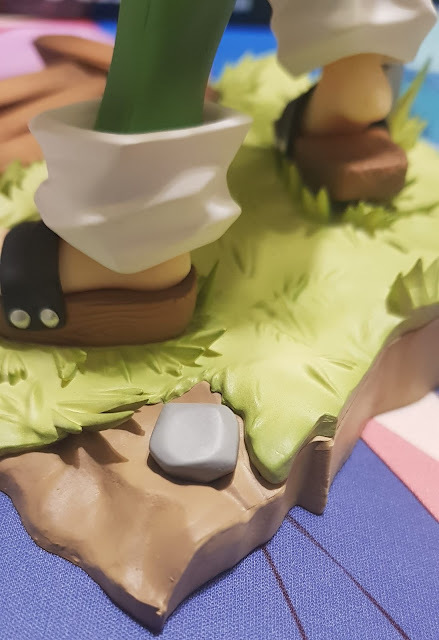 There is even a smooth pebble placed at the edge of the base to add more dimension and textures to the figure on the whole. 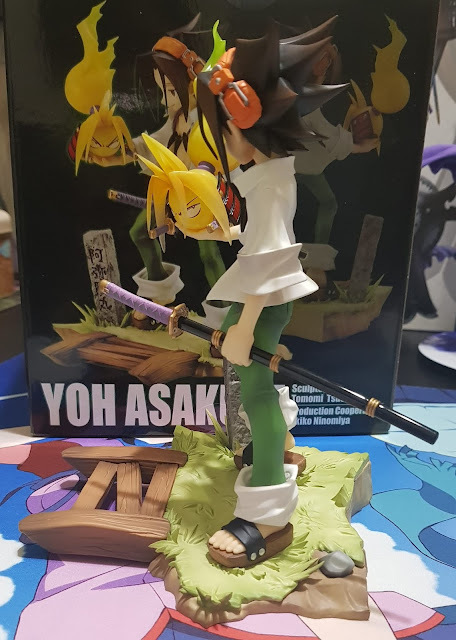 The sword for Yoh can be split into two parts to increase the ease of equipping Yoh with it. 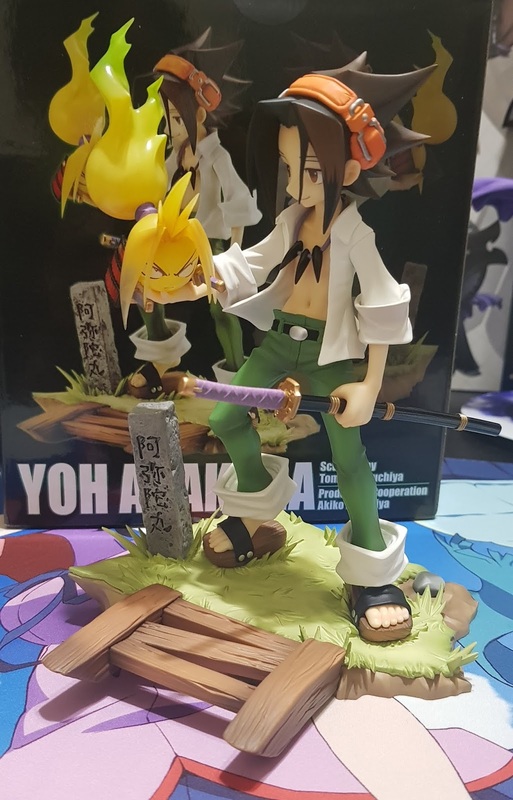 The procedure is extremely simple as well - where you just push the larger half into Yoh's hand and follow up by attaching the front half to make it into a full sword as well. 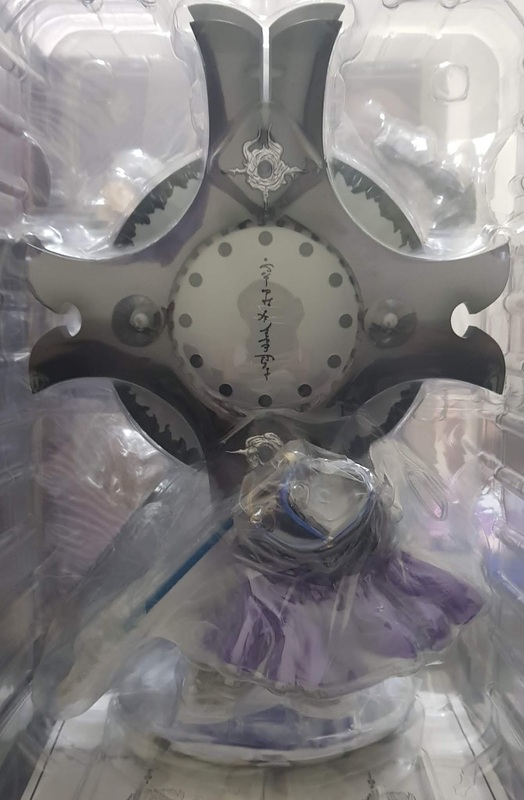 The other part that needs to be assembled would be Amidamaru's spirit ball, which is to be attached to Yoh's hand with this irregular peg. 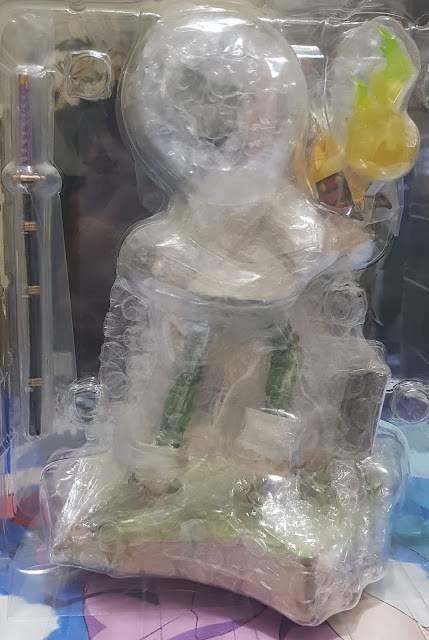 Amidamaru's sculpting and painting is delicate. 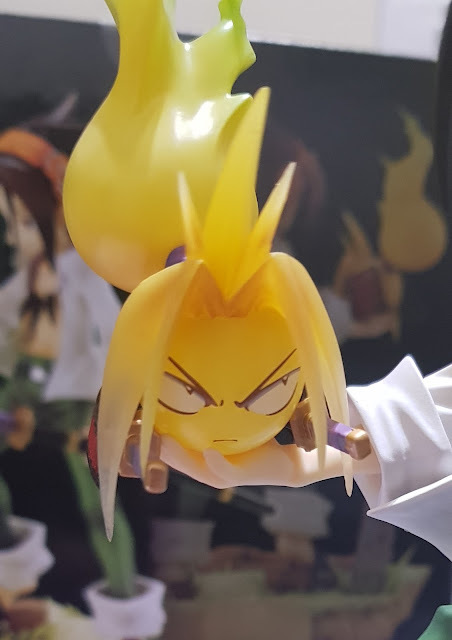 His hairstyle is kept accurately and cleanly despite his size. His hair also has a gradient from green at the upper tips, to yellow at the main body, o white at the ends. 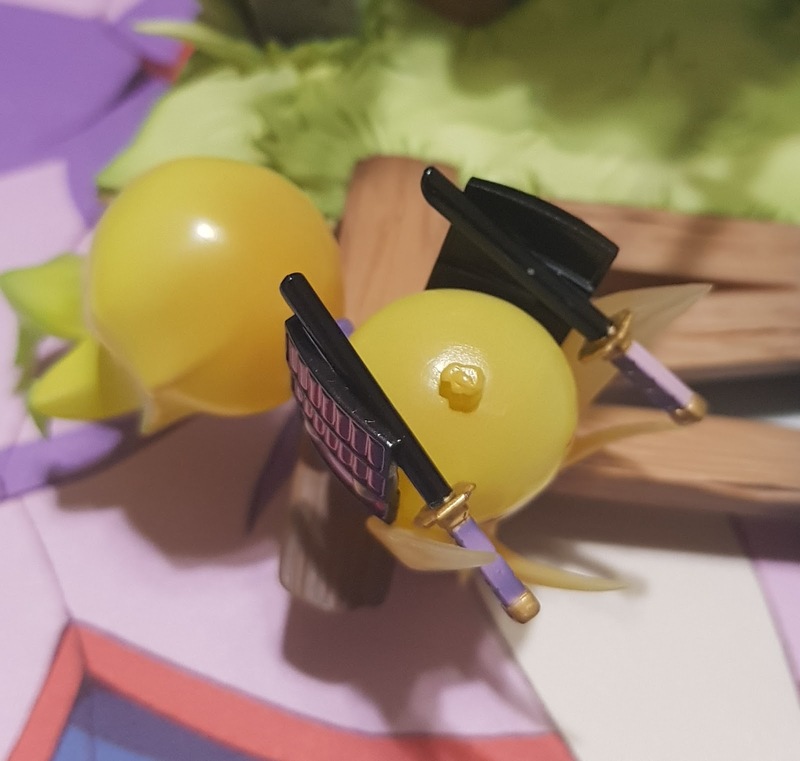 His eyes are drawn sharp and cold where he returns Yoh's gaze with a cold glare which is really characteristic of how Amidamaru was when they first met. Amidamaru also comes with red armor and purple accessories, where his hair tie and sword hilts are both lilac in color while his armor is mainly in a glossy red. 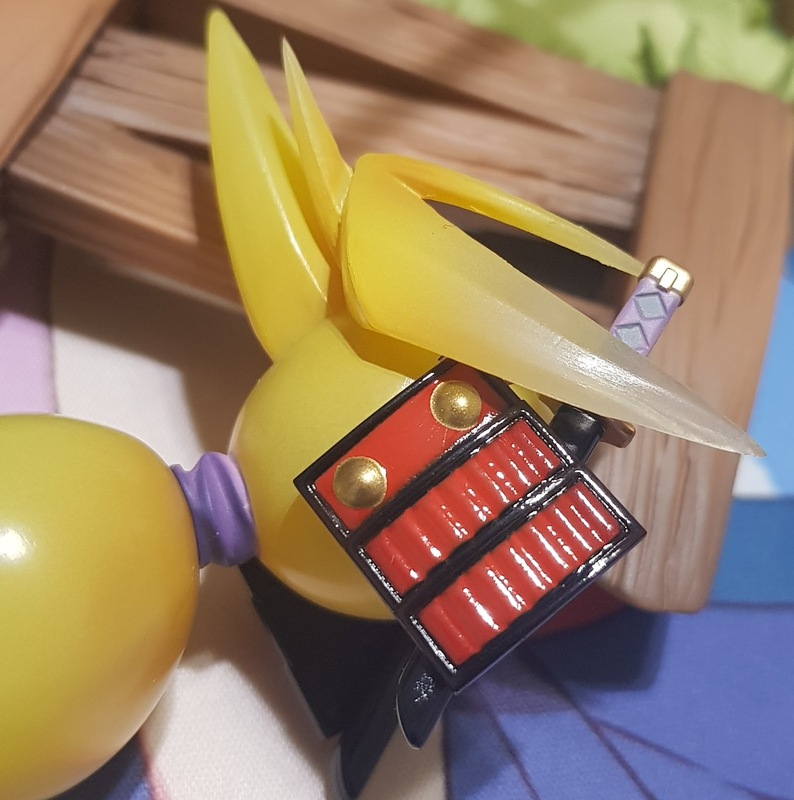 The underside of Amidamaru comes with a peg that you join to Yoh's hand to make it appear as if Yoh is cradling the spirit ball. And last but not the least, since Yoh's figure is completely assembled, let's take a slow 360 to showcase Yoh in his full glory! 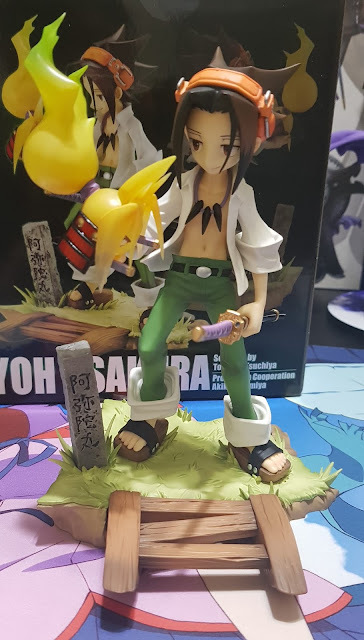 This figure should be crowned as a must have for any fan of Shaman King. 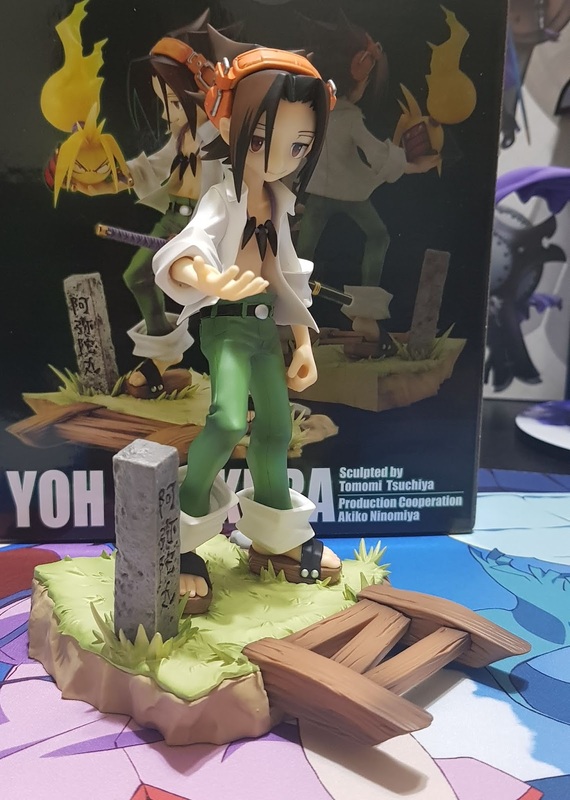 It looks marvelous even without Hao, but I think it would look a lot better with Hao to complete the look and bring more of the Shaman King universe to life! 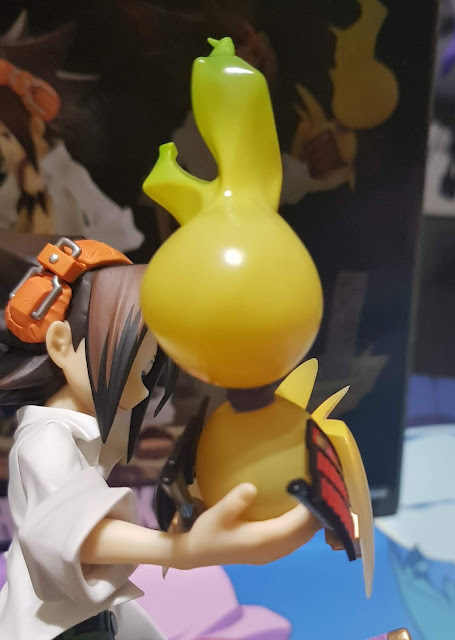 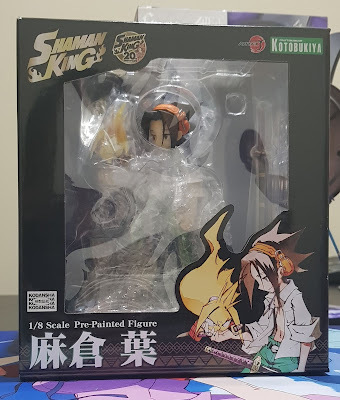 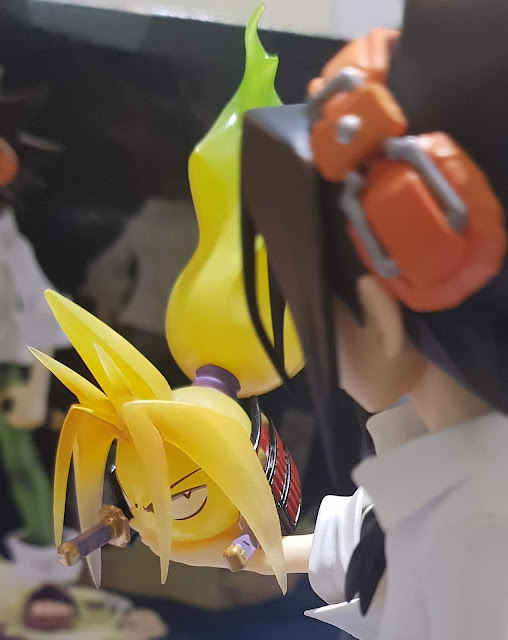 While the figure is crisp in terms of sculpting and painting, it is rather small (~20cm) compared to the size of figures recently (>20cm) and the artwork of Shaman King differs quite a little from the newer series which might make the figure appear awkward next to other figures.